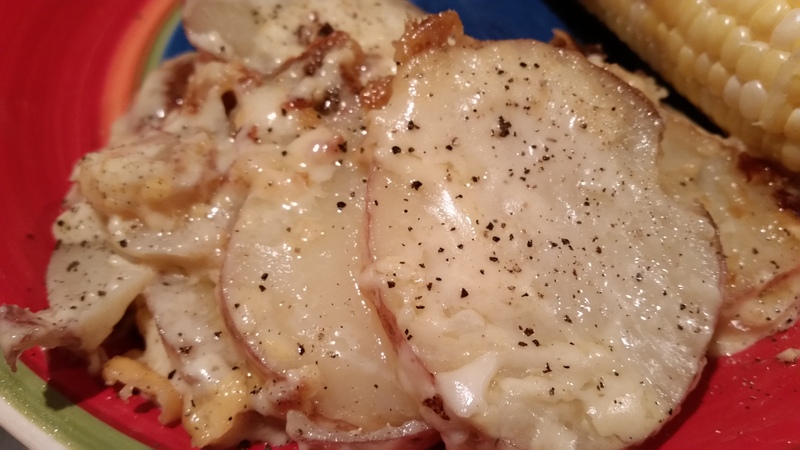 Garlic Potatoes Au Gratin – What's for Dinner Moms? Having lots of computer problems in our house. My laptop is out to be fixed so I writing on my tablet. Something that I am not used to at all. So please be a bit patient with me. Yesterday was the first day of school for both kids. Today my daughter has her first college class as part of her school’s duel enrollment program. I hope this goes well for her. I think I am just as nervous as the day she started kindergarten. I know she will be fine but I so want this first college experience to go well for her. The weather has been cool this week. Mid 60s means sweatshirts in the evenings and we are looking for more comfort foods. Our CSA share has tons of tomatoes, potatoes and eggplants. This was super garlicky and creamy just what we wanted on a cool evening. It had lots of flavor and just a bit sharp tang from the cheese. Leftovers were quickly claimed for lunches the next day. I served this with brats and roasted veggies for a complete meal. Preheat oven to 400 degrees. Grease a 13 x 9 with non-stick spray or butter. Spread 1/2 of potatoes and 1/2 sliced potatoes in bottom of pan. In a medium saucepan over medium heat melt butter. Add garlic to pan and saute for 1 minute until very fragrant. Add flour and whisk until paste forms. Whisk for 1-2 minutes until paste starts to slightly brown. Add milk in a slow thin stream while continually whisking flour mixture. Continue to whisk until sauce is thickened. Remove pan from heat and add 1 cup cheddar cheese, 1/2 cup Swiss cheese, 1/4 cup Parmesan, mustard, paprika, salt and pepper. Stir until smooth. Taste and adjust spices to your liking. Pour 1/2 of the cheese sauce over the potatoes shake pan a bit to get sauce in-between all the potatoes and onions. Layer the rest of the potatoes and onions over the potatoes. Pour the cheese sauce over the potatoes and spread to cover. Top dish with 1 cup additional mixed cheeses. Spray a piece of aluminum foil with non-stick spray. Cover dish and bake for 1 hour. Remove cover after 1 hour and return to over for 30 minutes. Remove pan when potatoes are fork tender. Allow to sit for 5 minutes before serving sprinkled with parsley, if desired. Thanks. I love potatoes. And cheese. And garlic. Sounds very good for the cooler season! I love potatoes, cheese, and garlic!! Btw. I cooked the pineapple porc chops (I just made it with chicken). It was great!! Thank you! I am so glad you liked it and I love that you made it so you would like it! I am glad you don’t mind the variation. It was really good. Thank you so much for that recipe!! Not at all! I actually encourage everyone to change the recipes to what they like. Change the meats, drop a spice, add a veggie whatever works for you! Sounds deliciously decadent! I must try.